Welcome to my blog - thoughts and commentary on responsible investment issues and trends. I recently gave a keynote speech to the British Columbia Teachers' Federation Social Justice Committee on the topic of Pensions & Ethical Investing. One of the issues I talked about was the issue of divestment and negative screening. Its a controversial topic that often gets a lot of attention, and so I thought I would share some of my thoughts which I outlined in my speech. I find that often when we talk about responsible investing, people get stuck on the issue of divestment. They think that the ONLY way you can take a stand on an issue and be a responsible or ethical investor is by dumping your stock in the company in question. This is problematic because divestment is positioned as a very black and white issue, when in fact there are many shades of gray. There are many strategies available to responsible investors - such as ESG Integration, positive screening, and shareholder engagement (see my previous blog The ABCs of ESG for more information on these strategies). I want to dive a little bit deeper into the issue of negative screening and divestment. Divestment, as you know, is the practice of selling your stock in a company as an act of protest against the company’s business practices. Divestment is often used as a tool to respond to critical incidents or controversial business practices. In June 2006, the Norwegian Government Pension Fund (that country’s former ‘oil fund’) made an historic decision – to publicly denounce Wal-Mart and dump its stock citing the company’s complicity in serious violations of human and labour rights. It was not the first time the fund had made a high profile divestment decision, and it was not the last. In February 2009, the fund publicly divested of Canadian mining giant, Barrick Gold pointing to evidence of severe environmental damage at the company’s Porgera mine in Papua New Guinea. The Norwegian fund is likely the most high profile and often cited investor that practices divestment. However there are other examples, most notably shareholders used divestment to force companies out of Apartheid South Africa. That particular event was spearheaded in part by a group of nuns in the US, and it was very successful. Divestment has also been used to mobilize against companies operating in controversial countries such as Burma or Sudan. Divestment is a blunt instrument and has its pros and cons. On the one hand, it can generate media attention and put public pressure on companies to clean up their act. Divestment can also absolve investors of any wrong doing, eliminating any financial benefit they derive from controversial business activities. On the other hand, some argue that you have to OWN the company to CHANGE the company. Divestment may have limited impact on the actual practices of the company in question, serving mostly as a short-term public relations challenge. Once you sell your ownership stake, you no longer have direct influence. And, you risk being replaced by another stockholder that cares little about ethical issues. Investors that are the most effective in their divestment strategies, such as the Norwegian fund, are supported by well-resourced and sophisticated research teams that undertake both desk research and on-the-ground and under-cover investigations of company practices. A divestment decision is not taken lightly by the Norwegian fund. Once made, the fund sells all securities and bonds of the company in question. The Norwegian fund is unique. For many pension funds, there are some technical challenges that can limit their ability to divest of a particular stock across all portfolios. Many pension funds are invested in 'pooled funds'. As this slide shows, when you are invested in a pooled fund you do not directly own the stock of the company. Instead your money is pooled with other pension funds and invested in several companies on your collective behalf. 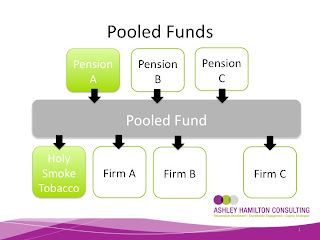 A decision to divest of one company, in this case, Holy Smoke Tobacco, cannot be made by one pension fund alone, but must be made in concert with the other members of the pool and the investment manager. Thus, divestment of the stock across all portfolios may be a significant challenge. For pension funds that want the flexibility of divesting of specific stocks there are a couple of options you can consider. First, the fund can start a conversation with the investment manager and other members of the pool about implementing restrictions on how the money can be invested. For example, collectively the members of a pool could implement a policy banning investment in all companies that receive greater than 5% of revenues from weapons production or sales. One drawback to this approach is that funds may face objections from other the pension funds in their pool or from the investment manager – who – we need to remember – is tasked with managing the demands and expectations of ALL the members of the pool. Second, the fund can choose to switch investment managers, and hire a manager that meets its environmental, social and governance criteria. We are seeing this more and more. Large and small pension funds are starting to evaluate new investment managers not only on financial performance, but also on whether they apply negative screens, or whether they include environmental and social factors in the investment process. There are limits to this too of course. Because of the structure and governance of some jointly-trusteed funds, this may not be a viable option, and there are costs involved in conducting a manager search. The third option is to change over to segregated funds. With segregated funds, you own the shares directly, as this slide shows. You are therefore able to make decisions independently of the wishes of other funds, in consultation with your investment manager. One drawback to consider however is that investing in segregated funds may come at a higher cost, since it requires significantly more administration than a pooled fund investment. As you can see, the technical challenges to divestment cannot be taken lightly. For that reason it is worth considering a fourth option, which is to practice shareholder engagement and use your rights as a shareholder to initiate discussions with companies in your portfolio about environmental and social issues. I have had some interesting successes and challenges in using shareholder engagement to address some difficult issues around mining and human rights in Guatemala. This experience highlighted for me both the pros and cons of taking a more active role in ensuring the companies you own stock in are meeting both your financial and social responsibility goals. It also highlighted the limits of divestment. Divestment should be considered carefully. It has been used effectively in the past, and is an important tool in the responsible investing toolbox. But it is not your only option. I encourage you to think about divestment within the broader context of the type of change you want to create, and the best possible strategy available to help you achieve it. Has your fund confronted the issue of divestment? What is your experience of the divestment debate? Have you resolved this debate within your fund, and if so how? I'd love to hear your comments or questions about this issue, please comment below - or on my facebook page. The opposite problem to the pooled fund is that of a managed portfolio in which the investment manager makes the investment and divestment choices within a broad discretionary mandate. The owner of the portfolio might want to employ Shareholder Engagement, but then find that the investment manager has divested the portfolio of that particular stock for more typical reasons such as poor financial performance. What is your view on (1) the involuntary divestment possiblitiy and (2) the balancing of interests between Shareholder Engagement to promote reform versus non-ESG/SRI reasons for divestment such as poor financial performance. Great question! I have certainly worked with clients where we were engaging a company, only to find out the client's investment manager has sold the shares for purely financial reasons. 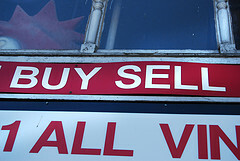 This can be a problem, especially for portfolios with high stock turnover. It CAN be difficult to continue a consistent and effective shareholder engagement strategy when the managers are buying and selling on a weekly and monthly basis. Ideally, you want to ensure that the engagement specialist is having conversations with the investment manager to avoid being surprised by any decision to sell, but this isn't always possible so we do the best we can. Some investors choose to continue engaging the company even if they don't own shares at that exact time. The theory is that the company is still within the investable universe, and therefore is eligible for the managers to purchase it at any time in the future. By continuing with the engagement process, the company may become more attractive for investment. Of course, if you don't directly own the shares, you don't have the same ability to influence and communicate with the company (for example you can't file a shareholder proposal or vote your proxies, and you may not be able to attend the annual meeting). I have worked with clients that get around the issue of involuntary divestment by buying a modest amount of separate stock (outside of their professionally managed portfolio). This allows them to maintain those shareholder rights and continue the discussion with the company should the investment manager sell the stock. However, as you point out, at the end of the day, the shareholder is seeking to make money, so if the stock is performing poorly, there may be no other choice than to sell the stock and stop engaging. Chances are, whatever companies replace the one you sold may also be good candidates for starting a new discussion on environmental and social issues!